Withrow got a brand new ice rink, seating and scoreboard thanks to the City and the Taber Family Foundation. Just in time for ball hockey 2019! A group of people who enjoy spending time at Withrow Park and who work to put together activities in the park and work towards park improvements. Click on their Facebook page for all the events, like the pumpkin parade, carols by candlelight, or the holiday camp fire! An outdoor dance festival that brings high quality contemporary and traditional dance to public parks. As dusk descends, a theatrical host leads the audience – which invariably includes children, dog walkers and local residents – to eclectic dance pieces that unfold in different areas of the park. Choreographers from various backgrounds are invited to perform a ten-minute piece inspired by the park’s natural environment. Audiences are invited on a pay-what-you-can basis to an innovative site-specific festival, which is not only an artistic event but a social and cultural one as well. 2014 will be Dusk Dances’ 20th season. A Toronto based theatre company dedicated to the rebirth of a Shakespeare tradition in Riverdale & Leslieville. 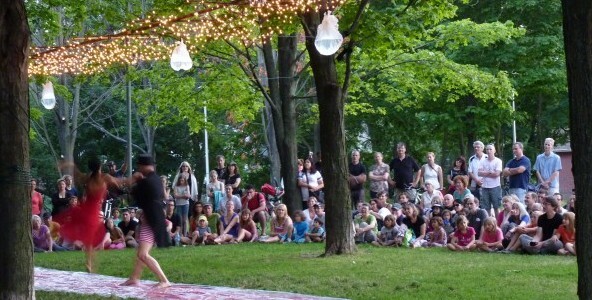 Annually performances in Withrow Park in the summer. 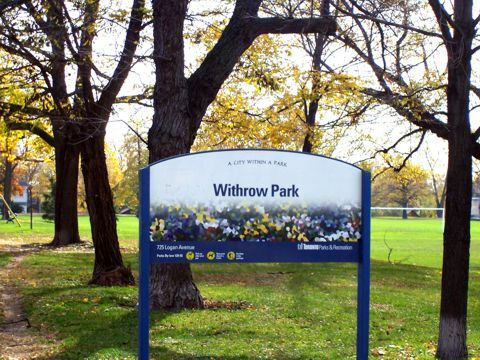 Official Toronto Parks and Rec info for Withrow Park. Includes the Withrow Clubhouse (kids activities, Tai Chi, yoga etc), skating rink, summer sports activities in the Withrow Soccer field. Over 40 years and running, the amazing ball hockey league that plays games on the Withrow Park skating rink every Spring and Summer. Registration is annually in January. Season starts in April.